Aluminum oxide is a mineral known by the decidedly un-romantic name corundum. Beautifully colorless in its pure form, impurities often find their way into the crystals to create a stunning range of hues. The red variety is ruby; all others are called sapphire. As ruby is the very definition of red, sapphire has become synonymous with blue. 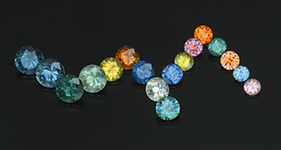 All other hues - pink, orange, yellow, green, purple and everything in between - are called fancy colored sapphires. The English word sapphire, which dates from the 13th century, originates from the Latin sapphirus, and the Greek sappheiros (blue stone), and even the Hebrew sappir, and possibly even from the Sanskrit sanipriya, which literally means precious to Saturn. Sapphires and their sister rubies are among the oldest gemstones known to man, and their legend and lore abound. Sapphire was one of the 12 stones in the Jewish High Priest's breastplate, and one of the foundation stones of the New Jerusalem. The prophet Ezekiel had a vision in which he described the throne of God as having the appearance of a sapphire. 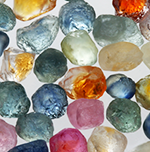 From ancient times, gemstones were thought to have mystical powers. Sapphire lore credits it with the ability to cure multiple ills of both body and mind, offer protection, and even garner divine favor (but only if the wearer is of pure virtue.) 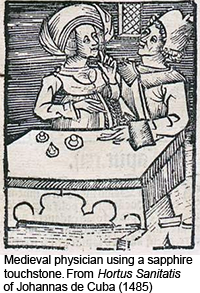 Medieval physicians thought it able to draw foreign objects from the eye and regulate body temperature. It was a stone held in high esteem, deemed suitable for the fingers of kings and priests. Sapphire is the zodiac stone for Virgo, the Indian planetary stone for Saturn, and is said to energize all chakras. Sapphire's heavenly blue hue calls to mind the bright, blue skies of autumn, which may have influenced its choice as the modern birthstone for the month of September. The ground beneath Montana's big sky, majestic mountains and rolling meadows is laden with nature's treasures. Gold was discovered in Grasshopper Creek in southwestern Montana in 1862, and the rush was on. Prospectors flocked to the territory, panning every river and creek in sight. Other gold strikes followed, giving rise to several "wild west" mining camps, including Bannack, Diamond City, Virginia City, and others. Ed Collins was prospecting for gold on the Missouri River bars near Helena in 1865 when he speculated that some of the colorful pebbles clogging up their sluice boxes might be sapphires. Collins collected some of the pebbles and sent them off for testing. They indeed turned out to be sapphire, but while "Sapphire" Collins is credited with discovering Montana sapphire, all he ended up with was a place in history. There wasn't much excitement about Collins' Missouri River sapphires, because most of them were pale colors not popular in jewelry at the time. The miners were interested in gold. Gemstones were of little value until they were cut and polished, and since there were no cutting facilities in Montana, and no ready market for the fancy colors, the discovery of sapphire really didn't cause much of a sensation at the time. In addition to the Missouri River bars, sapphire was later discovered at Rock Creek, Dry Cottonwood Creek, and Yogo Gulch. In 1895, another colorful character, Jake Hoover, gathered some of the blue pebbles from Yogo Gulch into a cigar box and shipped them off to Tiffany & Co. in New York for evaluation. In return, he received a check for $3750 for "sapphires of unusual quality." The velvety blues of Yogo were natural beauties of such quality they were comparable to those from the Kashmir region of India that had mesmerized the jewelry world of the day. Sapphires from all Montana locations were cut and sold for decades, both in the USA and in Europe, where they were known as "Montanas." Much of the less desirable pale, fancy colored material was sent to Switzerland to be used in watch bearings or elsewhere for industrial uses. ranging from 1 to 3 carats each, every one of a different tint or shade. yellow brown, and deep brown,pale blues and greens, blue green, etc. Often a single stone would show two or three distinct shades of one color. and other rich jewels made from these stones possess almost the beauty of natural insects." Today, rare, beautiful Rock Creek sapphires from Sapphires of Montana are readily available in a rainbow of hues that would cause Mr. Kunz to positively swoon. At 9 on the Mohs Scale of Hardness, Sapphires of Montana are perfect for jewelry of all types, offering a wide range of colors sure to please the discriminating lady who is of the opinion that diamonds are the perfect accent to color, because color is the star of the show. In 1953, Jacqueline Kennedy received an exquisite and unusual engagement ring designed by Van Cleef & Arpels consisting of a 2.84 ct emerald cut emerald mounted next to a 2.88 ct diamond, with tapered baguettes. More recently, Facebook founder Mark Zuckerberg gave his bride a Burma ruby flanked by diamonds. Then, of course, Prince William presented Kate Middleton with perhaps the most famous engagement ring of them all, his late mother's blue sapphire and diamond ring. Once the norm in Europe and still traditional in other parts of the world, colored engagement stones are becoming increasingly popular in the United States. Whether for an engagement, anniversary, or for no occasion at all, what could be more romantic than a rainbow of glittering Sapphires of Montana? Rare. Beautiful. American. Sapphires of Montana - Because where it comes from is as important as the one who receives it.